WASHINGTON -- Another leader of a Latino-focused organization is embroiled in controversy that is threatening his leadership of the group. Javier Palomarez, the head of the U.S. Hispanic Chamber of Commerce, has been under scrutiny from his board, which met Sunday to discuss allegations of sexual harassment and questions about his compensation, The New York Times reported. BuzzFeed first reported about an investigation into the USHCC finances and other conflicts between Palomarez and board members last November. Palomarez has acknowledged in a statement to the New York Times that he had an affair with a woman who was his superior. That woman was identified as Nina Vaca, former board chairwoman, in a court petition filed by Palomarez in a Dallas County district court requesting Vaca's deposition. Vaca had told told BuzzFeed News that she discovered the financial problems regarding Palomarez's compensation and brought them to the attention of the board. 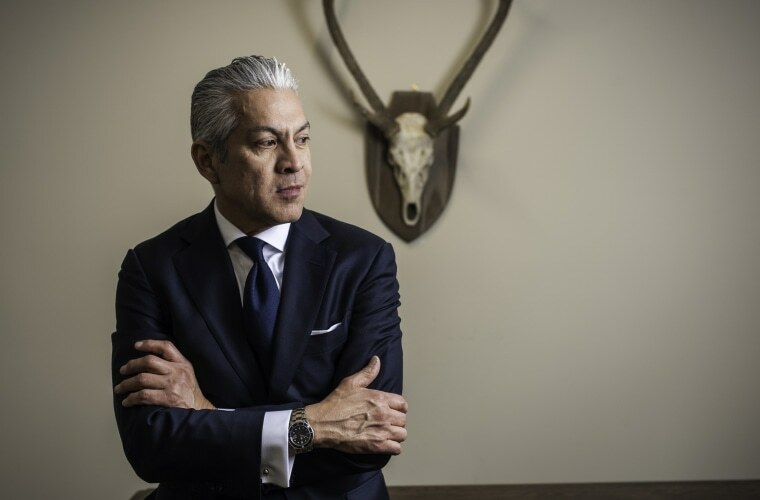 In a statement to the New York Times in response to its reporting, Palomarez said a "retaliatory effort to have me removed from my position as President and CEO of the United States Chamber of Commerce" is a consequence of him having ended the affair. In a statement to his board obtained by NBC News, Palomarez said, "I am guilty of an affair with one of your fellow board members. I ended it ... admitted it and have tried to move on," he said. He maintained in the statement to his board that he is not guilty of any of allegations of financial impropriety or sexual harassment. "To be clear, I have never stolen from our organization or improperly paid myself more than my contract allowed. I have never touched a team member who worked for me. I have never propositioned or made sexually suggestive comments to anyone I've worked with," his statement said. In a statement to NBC News on Monday, Vaca's attorney, Brent Walker, said, "Mr. Palomarez is being investigated for financial improprieties. That is a fact." "It's unfortunate that when faced with these accusations, Mr. Palomarez has chosen to deflect the investigation by suggesting they are the result of some supposed, personal relationship," stated Walker. "Ms. Vaca has always been committed to faithfully discharging her fiduciary obligations and doing what is best for the USHCC and the community it serves." Palomarez had faced criticisms before the allegations for having what some saw as a too accommodating relationship with the White House. He was part of a group of Latinos that meet regularly to advise the Trump administration on issues pertaining to the Latino community. Another Latino group leader, Roger Rocha Jr., president of the League of United Latin America Citizens, LULAC, also has run afoul of his organization. He came under attack recently when he wrote a letter dated Jan. 28 to President Donald Trump supporting Trump's demands for deep cuts to legal immigration visas, billions for a border wall and boosting of immigration enforcement, all items LULAC has opposed. LULAC's executive council, several of its state directors, local councils and councils for young members have demanded he resign. He has not yet done so. LULAC's board is set to meet Feb. 16-17 where he could be ousted.